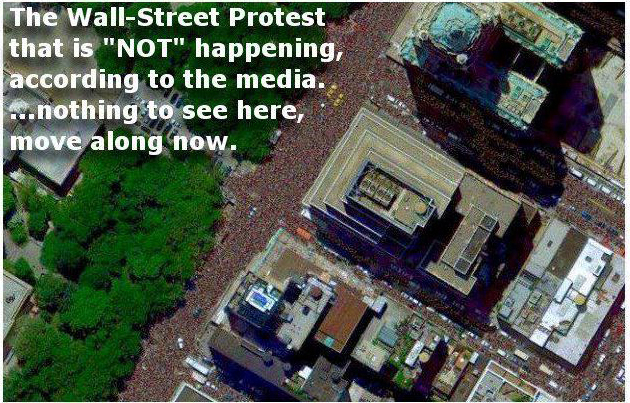 Karl reMarks: The Wall Street image the media doesn't want you to see? Fake! The Wall Street image the media doesn't want you to see? Fake! The image above has been doing the rounds on social media, with many claiming that there is a conspiracy to keep the world from seeing it. 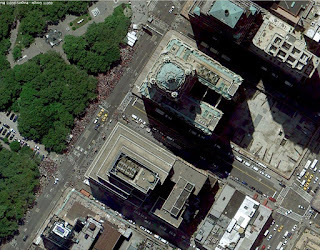 It allegedly shows a huge Occupy Wall Street demonstration near the Woolworth Building in New York. Some have even talked of the 'photographer' being harassed. Now this would be very entertaining if it's wasn't so sad that many intelligent people are falling for an obviously doctored photograph. Not only it's doctored, there's no photographer because it's taken from Google Maps. Here's the link for the image as it appears now on Google, and you can see that the same picture (above) has been doctored to show thousands of people on the street. The people who edited the photograph didn't even bother to change the cars that appear on the original and they copied the pattern made from the people over and over again. What's really sad is some people's belief in conspiracy theories is so strong that they uncritically accept amateurishly edited photographs like that as a sign of a conspiracy to conceal a demonstration with thousands of people. It's New York for God's sake!